Every night you can watch beach volleyball as the sun sets! Finally a new development that started moving dirt a few weeks ago, has plans for a marina!!!! I toured the development located on Nacascolo Bay and it also includes the oceanfront peninsula on the south side of this bay and a connection into Pacific Marlin. This massive project with 81 manzanas will be built in two phases and plans include a marina on the north side of the bay, boardwalk with food and beverages, shopping, horse stables, a hotel, camping, etc. Contact me for more information!!! Daniel Ortega, the president of Nicaragua, requested to start the dialogues again with representatives from the various social and business organizations. The morning of the first session, he released 100 political prisoners from jail. I do not know what has been happening in the dialogue but I’ve heard a rumor that more of the political prisoners are also scheduled to be released. Here is a link to an article in the Washington Post for a little more information and I’m very hopeful for more positive news soon. The government is imposing new taxes of 7-16% on certain items like beer, cigarettes, and other things considered a luxury. Not everyone agrees with this but in my opinion it is a way of collecting tax money from those who can afford these items, since so many Nicaraguans do not pay any taxes on their income. It is also a way to generate a little tax income from foreigners too. New minimum monthly income requirements for residency is official. To apply for residency you need to prove: $1,000 or $1,250 monthly income depending on the type and source of the income. The previous requirement of $600 monthly has been the same since I moved here in 2006 therefore considering inflation; it is now in line with the times. The A. Jean Brugger Foundacion has been at Pelican Eyes since the beginning and was one of the many reasons I chose to move to SJDS 14 years ago; I really appreciated what they do for the community so I sponsored students when I could and currently I employ two of their college graduates at Discover! Now they have purchased land to build their own facility to better serve the community. Please consider contributing to this valuable education program for the community. For ways to donate, visit their website. Want to work online so you can live in San Juan del Sur but don’t know who to work for? Maybe this company can help! Being an expat can be both the most amazing experience in the world and the hardest. From fantastic new friends, to feeling far from home, find out just how simultaneously difficult and awesome life abroad can be in this article! Tips of the trade, insider secrets, loopholes—whatever you want to call them, they certainly can help you. When it comes to getting your US passport, WeExpats did the research and uncovered some of the top US passport tips for when you are renewing your US passport. Renewing your US passport is done through Form DS-82, and there are several little hints and secrets that can arise through this simple form. Check out the full story in this link because you can even have TWO passports!!! Looking for a rental for your next vacation or looking for someone to promote your property for rent? Check out the rentals page on our website. Here is one of our favorite houses to rent to clients! If you don’t have property insurance, I highly recommend it! Now it is easier to acquire in SJDS, please ask me for details. Want to Sell Your Property Faster? Get a POA Now! We can add videos to your listings; check out the video at the bottom of the description for La Santa Maria. If you are traveling from any of these countries, and you are traveling to Nicaragua, you must have a certificate proving you have been vaccinated against Yellow Fever or you will be denied entry into Nicaragua!!! Here are just a “FEW” of our almost 300 listings! Visit our website to see more! Type reduced or bargain in the keyword box and quickly find all the reduced properties or bargains on our website! The Cala Azul residential community is located just north of San Juan del Sur, Nicaragua. Wrapping around a small, very private, horseshoe shaped bay, this development has various access points to the Pacific Ocean. The development currently has many finished houses, and residential only building lots are for sale. Future phases include a condominium project, luxury townhouses, and a location for a boutique hotel and restaurant, all with a focus on nature, relaxation, and high quality. Lot # EC 12 is currently the best property value in the Redonda Bay area. Surrounding Redonda Bay are three developments: The Aqua Wellness Resort (soon to be known as Six Senses Nicaragua), Buccaneer Point, and El Castil. All three have recently formed a single Home Owners Association. Aqua is a 5 star resort and has been purchased by the developer of The Ritz-Carlton Residences Miami Beach. Lot EC 12 is located within the El Castil development and offers stunning views of the Pacific Ocean. Next door to the lot is a beautiful home. 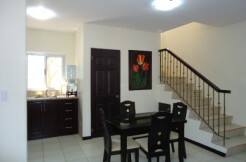 The property also offers an easy walk to Playa Gigante to enjoy the small beach town amenities offered there. The access road goes directly behind the lot making it easy for access and parking at your dream house you will design and build! Make an Offer! Villa Azul is a beautiful 2 bedroom ocean view house for sale at Villas de Palermo with a great rental history and return on investment. The split-level house features vaulted ceilings with fans and air conditioning, allowing for an abundance of natural light and airflow throughout. The fully furnished home is decorated in a Mediterranean style and includes luxury Nicaraguan hardwood furnishings. As a resident of Villas de Palermo you will have access to many amenities including their Home Owners Association which includes property management and rentals all for one price. Here is an “example” of a completed customized house from one of our clients who purchased in the Villas de San Juan development in Las Delicias, just minutes outside of San Juan del Sur. These concrete structure homes are designed for 300 m² lots in the development and feature 2 bedrooms, 2 bathrooms and a carport, however it is possible to modify the carport into a garage or a 3rd bedroom. This is one example of what you can build. Vista del Oro is an ocean view, hillside development in the El Oro community, just 5 km outside of San Juan del Sur. The ready to build lots will have access to utilities, with water coming from the community well on the development, and underground electricity however solar is a better option. The entrance to the property features an ornate security gate, and decoratively paved internal roads. The hillside locations gives all lots pristine ocean and valley views, while the gentle slope makes building easy. Enjoy some of the best sunset views year round, as you look out to the bay of San Juan del Sur, and Nacascolo Bay. This lovely vacation condo in Bahia del Sol is stress free with on site management team handling all your maintenance and rentals or live in it full time. This is a great 2 story unit with 3 bedrooms, 2.5 bathrooms, spacious kitchen and living room with dining area overlooking the development pool. The condo also features a locked storage space with washer and dryer to keep personal items year round. Contact us now for more information on this great investment opportunity! Casa Olimar is a 3 bedroom villa located on lot F-8A in the exclusive and gated community of Pacific Marlin of San Juan del Sur above Nacascolo Bay. This new house, completed in 2015, has a modern design and spacious open floor plan with views to the Pacific Ocean from all the rooms. Enjoy 4,000 ft² of spacious rooms with plenty of windows and sliding glass doors to view the outside world and the incredible views of the ocean and Pacific coastline to the north. 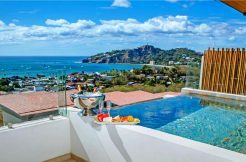 Casa del Mar is a 6 bedroom beachfront house located two and a half blocks north of the Restaurant El Timon in San Juan del Sur. The recently remodelled house previously operated as a b&b, bar, and restaurant. It features 6 bedrooms, 3 bathrooms, a kitchen, storage area, and 2 terraces. The great downtown location makes Casa del Mar the perfect place to run a business. There is also room for modification, with space to build a second floor, which would allow for views of the entire bay. Whether it be for personal use, a small hotel, or a bar and restaurant, this house has unlimited potential! Casa Santosha is a beautiful duplex, consisting of 3 bedrooms and 3 bathrooms on an approximately ¼ acre lot, located in El Camino del Sol, just 5 minutes from San Juan del Sur. Inside the air conditioned house, there is a full size kitchen with stainless steel appliances, hot water, and a washing machine. The property offers a large patio area which is located between the 2 casitas. Here you’ll find an outdoor living room, with a large dining table (seats 9), a peaceful trickling fountain, and an outdoor shower. Private parking is available for 3 vehicles, with additional guest parking at the nearby pool. There is also an additional building that can be renovated into a rental, storage, or garage; the possibilities are endless! Casa Santosha is ideal for privacy minded owners, or for renting, with the option to rent to small groups (comfortably houses up to eight guests) or on a room-by-room basis. 2 neighboring houses for sale in Las Delicias, just minutes outside San Juan del Sur. The 2 houses share septic and water hookups, however have individual electricity meters, making this the perfect, all in one, living and rental investment. The first 137 m² house features 2 bedrooms and 2 bathrooms, a kitchen, and living area. A covered patio allows for outdoor living space. The second 157 m² house has 3 bedrooms and 3 bathroom, a kitchen and living area. Both houses are being sold fully furnished. This unique offer has great potential. There has been a proven rental income in the past years for both houses. Choose to live in one and rent the other, rent both, or save one as a guest house for visiting family and friends! You could even take advantage of the convenient proximity to both San Juan del Sur and the Southern Beaches such as Playas Remanso and Hermosa, and turn the property into a surf lodge. The options are endless because there is additional space to build more houses on! Located on Playa Marsella, Bosques del Mar is a real estate development designed around community and nature. The goal of giving it’s residents the feeling of being immersed in nature is met, while being just 15 minutes from the amenities of San Juan del Sur. Bosques del Mar is the only development with its own beach front lot on Playa Marsella. Featuring ranchos, grills, bathrooms, and an outdoor shower, this area is exclusively for use by owners or renters of the development. This beach is a favorite of children and families, as its small waves make it known as one of the better swimming beaches in the area. Fabulous Rental House with 3 Different Configurations! This fabulous 2 story residence produces great rental income thanks to its thoughtful design with a separate pool house and outdoor kitchen in the pool rancho; ideal for the perfect vacation rental property. The first floor of the main house contains a full kitchen, living/dining space and two bedrooms. The 2nd floor has an open kitchen design on the covered patio, a bathroom, and two bedrooms. The pool house contains another bedroom and bathroom for use when at the lap pool. Some recent upgrades include a new washing machine, new sinks, new outdoor furniture, new counter in the main kitchen, upgraded bedroom furniture, new paint, etc. The fabulous house is located on a 1,900 square meter lot in the secure community of Little Bavaria, just five minutes from San Juan del Sur above Nacascolo Beach. It includes a gardener and security guard as part of the HOA. Reduced prices NOW starting as low as $87,752!! This flat 3,525.06 square meter lot, almost 1 acre, is only 5 minutes to the famous surf beach, Playa Yankee. The lot is located in a small but growing village and is perfect to develop because it already has water and electric to the lot. Only fifteen minutes to San Juan del Sur along mostly paved roads makes accessing the amenities and nightlife of San Juan del Sur easy. Become part of this delightful community with fast and easy access to surfing at Playa Yankee or Hermosa. Contact us now to take advantage of this opportunity in Nicaragua real estate. Perched on top of a hill overlooking the valley of Las Delicias, you have a bird’s eye-view of your surroundings and total peacefulness. Watch the storms rolling in across the valley, the twinkling lights of the houses below at night, or the birds soaring in the sky. The main house has 3 bedrooms and 2 bathrooms, with a 1 bedroom and 1 bathroom studio apartment underneath at the pool level. Use the studio for rental income, a workshop, an art studio, a mother-in-law suite, the pool level kitchen, etc., the possibilities are endless. This bargain house sits on a 7,050 m², lot leaving 63,370 m² open for development. Water and septic have been run to several potential lots to be sold off, or you can keep it all for yourself for the ultimate amount of privacy. The caretaker house, which is well removed from the main house, is located at the bottom of the hill, beside the entrance to the property. This beautiful 3,531 m² lot is located in a small very rustic barrio on the Chocolata Road, overlooking Nacascolo Bay, just minutes north of San Juan del Sur. Enjoy fabulous ocean views from this ready to build lot, with access to all basic services. Experience a true rural Nicaraguan lifestyle, with pigs and chickens in your neighbor’s properties, and howler monkeys swinging in the surrounding trees! No Rules, No Restrictions, No HOA fees! Bargain at $25,000!!! Priced to sell is the well maintained, open and airy Casa Santa Rosa, located in the established, quiet community of El Camino del Sol, just a quick 5 minute drive to downtown San Juan del Sur. Situated on a large, usable ¾ acre lot, with massive trees (that host howler monkeys regularly), you could easily expand without sacrificing your privacy. The home has 3 bedrooms, each with a private bathroom (with shower), vaulted ceilings, plenty of windows and air conditioning to ensure comfort. The large, open style kitchen includes a big island with plenty of room for entertaining. A laundry room, large car garage, and storage bodega are included benefits. The center of the home boasts a large thatched roof rancho for outdoor dining and relaxing, providing cool breezes and constant shade. The fully furnished home has tasteful décor that highlights the charming Nicaraguan building elements. Studio Rio Jaio is a 1-bedroom studio apartment located in the Pelican Eyes Resort in San Juan del Sur, Nicaragua. Although it is a studio, it is surprisingly spacious, with a grand bathroom and lots of storage space. 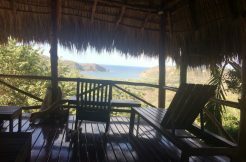 Sit back and enjoy incredible ocean and valley views of the San Juan del Sur area from your patio. As a resident of Pelican Eyes, you have access to all the amenities the resort has to offer, including 3 pools! Only $928.67 per sq. meter or $86.25 per sq. foot for the stunning Casa Cooper Villa in Pelican Eyes development, located in San Juan del Sur. Literally, view paradise FROM paradise. You could not build this massive house for this asking price and it consists of 2 individual units, containing a total of 4 bedrooms, 2 futons that convert into queen size beds, 2 living areas, 7 bathrooms, and 2 private swimming pools. This means it has the potential to be operated as a large single family unit, live in one unit and rent the other, or as a rental property comprising 2 separate but connected villas. Bayview Terraces is a solidly built (concrete structure) completely renovated 2 level townhome, located in the quiet La Talanguera area. This 2-bedroom townhome was completely renovated and updated recently, and is being sold fully furnished. The well-equipped kitchen features new appliances, custom built wood cabinets, a custom wooden breakfast counter, and a fan assisted exhaust from the stove to the exterior. The living area has new furniture throughout, as well as a custom-built wooden TV console. There is also a guest bathroom on the first floor. Upstairs you’ll find 2 large bedrooms with a shared balcony, where you can enjoy incredible views of the Pacific Ocean. There are also 2 full bathrooms on the second floor. The entire townhome features custom built California wooden blinds on all windows, 3 new air conditioners, as well as a solid new roof. Lot 62, located in the Paradise Bay development of San Juan del Sur, features breathtaking views of the Pacific Ocean, all the way to the mountains of Costa Rica. This 1,018 m² READY TO BUILD ON FLAT LOT is the perfect place to build your dream home!